Additives, preservatives, endless chemical compounds with unknown effects, and even antibiotics abound in our food supply. In this over-packaged, over-processed world with industrial agriculture doing violence to the planet, it makes sense that some have turned to a raw food diet. 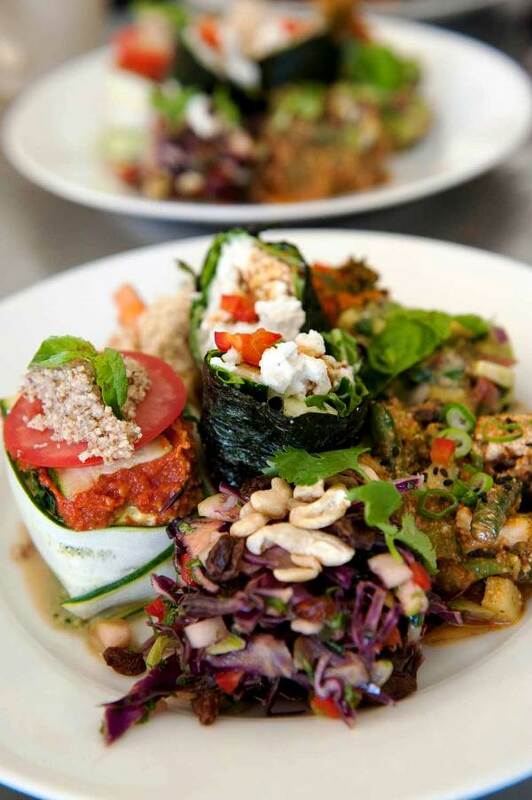 The first dedicated raw food restaurant opened in London in 2005. The movement has continued as background noise for a decade, but in recent years thanks to blogs and even a host of raw food diet and magazine apps, it has gained new adherents. Even supermarkets have started advertising some of their produce, such as nuts, as “raw” food. 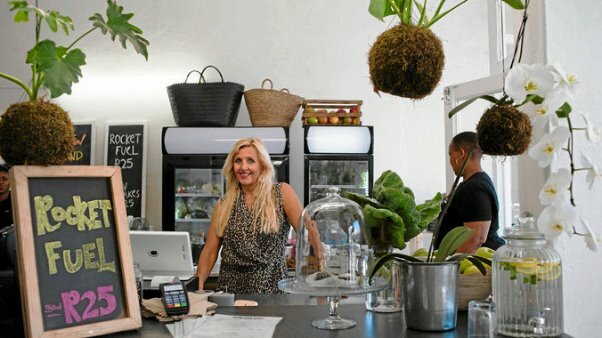 Cape Town now has its first dedicated 100% vegetarian and vegan friendly raw food restaurant and deli. In April 2014, Danish-born Beatrice Holst opened Raw & Roxy next door to the Old Biscuit Mill. In January she moved to new, larger premises across the road. The menu is simple – juices, smoothies, large (R70) or a small (R50) vegan platter, warm tonics and a few desserts. As it is pretty much a hands-on affair, don’t go if you are in a rush. The restaurant is open from 9am to 5pm. If you’re coming for breakfast, keep in mind there is no coffee nor anything else over 48°C. There is however a ‘hot’ tonic which tastes like warm chocolate. Ask Beatrice what is in it on the day, and she will give you an incantatory sounding list of impressive ingredients such as ashwanganda, chaga, astragalus, maca, rhodiola, tulsi, reishi mushroom, burdock, juniper berry, raw cacao, and kidney tea. The vegan platter with its delicious combinations of unadulterated flavours gives one exactly that healthy buzz our scorched palates crave. Usually consisting of seven or eight small salad portions, the menu changes, but here is a typical sampling (remember all ingredients are raw): basil pesto and red peppers on courgette spaghetti (made using fat courgettes and a spiral cutter); zucchini sliced to form “lasagne” layers between cashew cheese, red pesto, Swiss chard and cucumber; cucumber salad with garlic dressing; salad of thinly sliced apple, shredded red cabbage, julienned carrot, cashews and raisins; Kung Pao cauliflower, carrots and white cabbage; Thai red curry broccoli and mushroom. Many of the dressings are sweetish from dates or honey (which some vegans might not approve). For dessert, try the superb, creamy textured, melt-in-the-mouth cacao mousse cake, surprisingly made with avocado flesh and coconut oil. The base is date and almonds and it’s elegantly topped off with cacao powder. The scrumptious food and the casual, friendly ambience of the place is seductive. But do not get seduced into believing a raw food diet will work health miracles. This is not to say we aren’t slowly being poisoned by junk food, but unfortunately much of raw food believers’ claims about vitamins, antioxidants, enzymes and so forth are incontrovertibly factually wrong. Strictly adhered to raw foodism is dangerous, and if imposed on children it is tantamount to abuse. The problem with this pre-paleo diet is that it ignores the coevolution of our gut and its digestive bacteria with our diets over thousands or even millions of years (if archaeological evidence of cooked food in the Swartkrans is to be believed). Cooking food was one of the greatest breakthroughs hominids ever made. It is the reason we have big brains and small jaws. Many foods are harmful if eaten raw. Cooking not only vastly increases the calories we obtain, but also saves huge amounts of energy otherwise expended chewing and digesting raw food. Beta carotene is more easily absorbed from cooked than raw carrots, as is lycopene (one of nature’s most powerful anti-oxidants) from cooked tomatoes. Many high-speed food processors and juicers used by raw foodists are as likely to destroy vitamins as heat. Recent research shows that while total vitamin C content may be slightly reduced by cooking, nutrients are concentrated and antioxidant activity is optimised and can even increase hundreds of times when foods are cooked. Among other problems, people who have adhered to the raw diet for a decade, show loss of bone density and women get amenorrhoea. In the teeth of the urban rat race, raw food promises a symbolic harmony with nature. Becoming dogmatic about it, however, is bad for your personality and your health. Raw & Roxy, 300 Albert Road, Woodstock, Cape Town. Tel: 079 599 6277. This article was first published in the Mail & Guardian on 22 January 2015.